On Sunday, I went to Muiravonside Country Park, near Linlithgow with the Green Team. It was a very enjoyable day and we started off planting trees to create a hedgerow around a farm field and looking around the farm and seeing all the animals there. 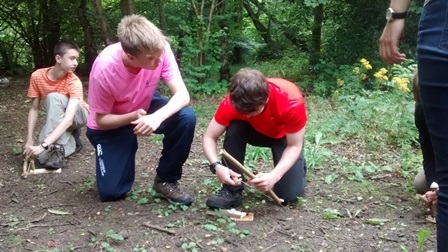 Whilst we were taking a break for lunch we did some bush craft, where we made some bread to toast on the fire and we also learnt the traditional art of making fire using a bow drill, which was great fun, but very frustrating trying to create some sparks! After lunch, we went back to where we were planting trees, and continued planting some more. It was amazing to see how fast everyone could plant trees once they got going. Once we had finished, there were still plenty of trees left over and the countryside ranger told us we had planted around 500 of them along the side of the field! 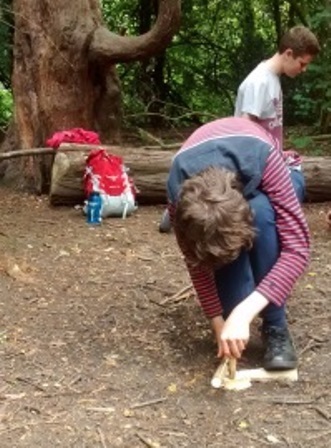 I enjoyed learning how to use a bow drill to make fire (although I didn’t have much luck) and also learning how to plant trees efficiently in to the ground. All in all, I think it was a great day out and I learnt a lot, plus everyone did a great effort managing to plant all the trees for the hedgerow.